In a book I can write any scenario that comes to mind, no matter how complex, and let the reader's imagination take the role of artist and sound producer. On the other hand VR experiences provide an opportunity to make the user feel part of the scene - to enter the story and see it unfold first hand. 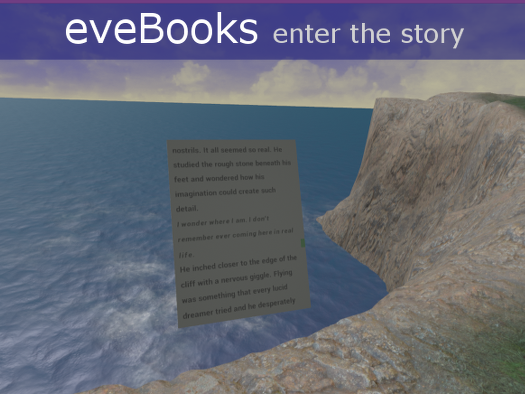 This Tech Demo merges books and VR to make use of the strengths of each of them. Present a book in VR. Use tiny head movements to track which line is being read. Change the scenery around the player to allow them to fully experience certain locations. Use ambient audio to increase immersion and positional audio effects to direct the reader's attention to changes in the environment. Some scenes will rely more heavily on the book and the reader's imagination, others will focus more on the VR experience. The reader controls the progression of the narrative. They stay in a scene until they choose to continue reading the book. The reader can walk away from the book and interact with the environment. We don't have to compromise the story we want to tell just because parts would be too difficult to produce in VR. The text can be shorter and less descriptive than a normal book because the reader will see important objects in great detail and receive other information via audio. We can move the reader to different locations, removing any potential nausea caused by locomotion. The demo shouldn't be very demanding on hardware and you can change the graphics quality using keys 1 to 9. Setting 4 or 5 is recommended. Instructions and two books are included in the demo. G.D. Journal is a short story that demonstrates the ideas discussed above. Eve-Books Tech Demo demontrates further examples that are not part of a story. The demo mainly makes use of sounds from www.soundeffectpack.com. If you need some sounds, buying through my link will earn me some commission and help fund my VR projects. In the near term software enhancements will allow the text to be rendered more clearly. Consumer headsets will have a higher resolution than the DK2 allowing a smaller font size to be used. Longer term, HMD's may include eye tracking which would be more precise than the head tracking used in the demo. As a small indie developer your feedback is very important to me. Please let me know what you thought was good or bad about the demo or the concept at this reddit thread or contact me directly.